Staatsbosbeheer, a Dutch public organization that manages a sizeable amount of the nature reserves in the Netherlands, commissioned NPSP and Faro architects to design and build low-maintenance, environmentally friendly and natural looking sanitary facilities for their nature camp sites. 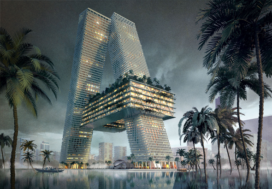 For both their environmental as well as aesthetic goals the use of NaBasCo to produce the units was well suited. 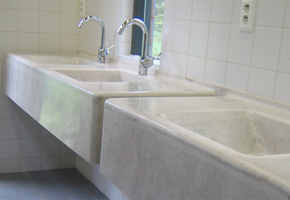 Using natural fibre composites resulted in maintenance free wash basin and toilet units that are more environmentally friendly produced than with traditional materials. For the ’natural look’ NPSP has used a milky, semi-stransparent resin, which shows off the fibre and emphasises the natural character of the sanitary facility. Maarten van Severen (1956-2005) created the elegant design for a piece of furniture that reflects his personal and design philosophy: straightforward, well-considered and made with modern materials. 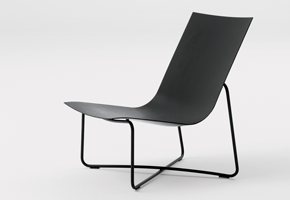 In cooperation with Pastoe and Ecological Textiles, NPSP has developed an environmentally friendly variant of the Low Chair based on biocomposites where the glass fibre is replaced by a natural fibre, in this case flax. 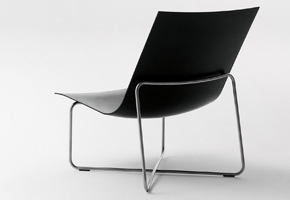 The polyester hull is lightly curved, 4 mm thick at the edges and 8 mm in the middle of the seat, giving the chair a slender and delicate appearance without having to forego strength and stiffness. The RVS inserts are invisibly integrated, resulting in a direct fit of the seat to its steel frame. The natural basic materials allow the seat to ultimately be used as biomass, producing green energy at the end of its life cycle. The 12.5 kilometre Barapullah open sewage drain runs through the centre of New Delhi. MVRDV and CITYBLOB have made a plan to turn this heavily polluted drain into a clean and safe eco-boulevard that connects a multitude of Delhi’s historic treasures, hotels and metro stations via newly added slow traffic lanes. A closed underground sewage system will be added to the green backbone to separate the polluted water from the rain water. 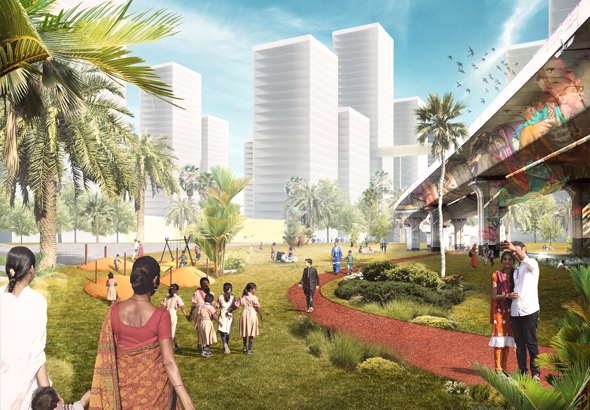 On ground floor level the extensive landscaped public spaces will facilitate sport, cultural and community activities and connect neignbourhoods from each side of the old drain. 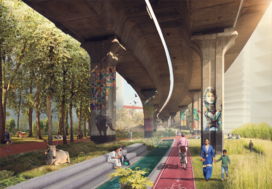 The necessary infrastructure and new public space wil be financed by the profit on real estate development in the empty land in close proximity of the drain. As the average property price per square metre price is one of the highest in the world, the whole project can finance itself. Cityblob is an Amsterdam-based architecture, urban planning and real estate development company with a particular focus on railway and underground stations and their surrounding areas. 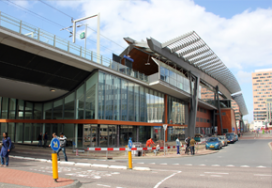 A recently realized project is a large-scale sport, retail and leisure development that is part of the new Amsterdam Bijlmer Arena railway station. 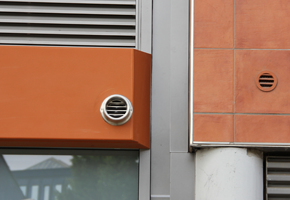 For this project specific dark orange coloured composite façade elements have been developed. A similar project Cityblob is currently working on will have façade elements made with natural fibres instead of glass fibre. These elements are developed in close cooperation with NPSP Composites. NPSP is the European industry leader in sustainable composites. 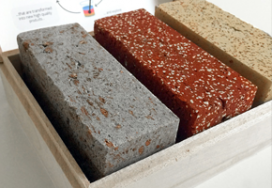 Working with natural resources such as flax, hemp and bio-based resin, NPSP produces composites with a longer life cycle and a highly reduced waste production, while maintaining true value for money. 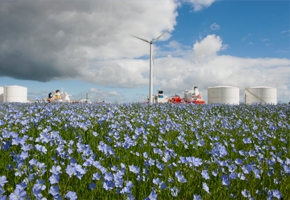 The bio-based composites developed by NPSP are sold under the Nabasco® brand name, short for nature-based composites. 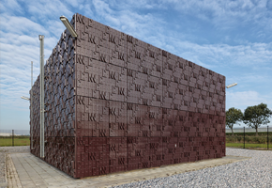 LOTUS will demonstrate a novel holistic (waste-)water management approach for the recovery of water, energy and nutrients from urban wastewater. The required treatment and reclamation steps will be determined by the water quality needed for safe and healthy reuse in households, industry and urban agriculture. Innovative but proven robust technologies, will be incorporated in a modular pilot treatment plant along the Barapullah drain in New Delhi, India. The programme consists of 3 research lines (4 projects); Together with researchers at the Netherlands Institute of Ecology (NIOO-KNAW) Gert Jan Scholte Architects is working on a new urban planning and architectural design based on a new treatment method that uses bacteria and microalgae to treat raw sewage water and reclaim valuable substances in it. 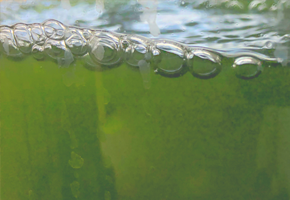 NIOO considers microalgae to be more than just tiny green plants. 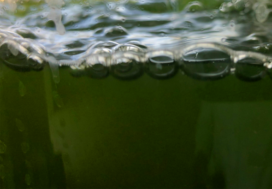 Certain members of the Chlorella-family will grow on the wastewater that comes out of the anaerobic reactor, which has a unique composition. These algae can absorb useful substances, such as phosphate and nitrogen, from our feces. All they ask in return is light and CO (and any CO² not released into the atmosphere helps to reduce the greenhouse effect). 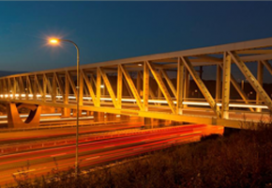 According to DSM the benefits of composite bridges for the end-customer and the environment are as follows. Composite bridges can be easily installed because of their low weight. This reduces installation time and potential disruption to traffic and people. 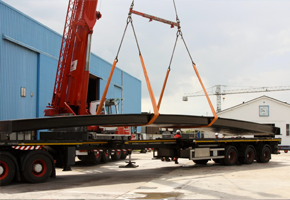 Also the lower weight requires lighter foundations compared to bridges made in pure steel or concrete. Because of their very nature, composite materials resist well water, heat and chemicals. Therefore these bridges only require limited maintenance (unlike steel bridges that need painting after some years of use). 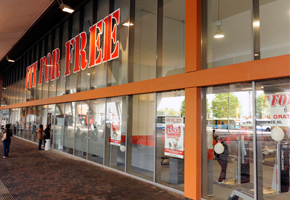 This saves time and cost, while again the impact on the environment and traffic is minimized. For the bio-bridge project of Fibercore the novel Synolite™ 7500-N-1 resin of DSM is used. 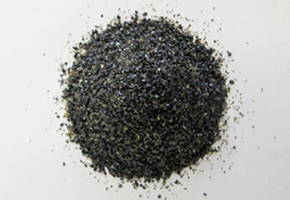 This is a high strength structural resin partly based on renewable raw materials. 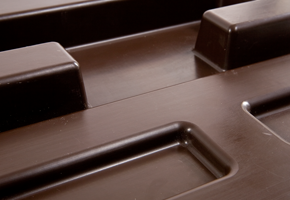 The resin can be easily converted through vacuum infusion manufacturing processes into composite components. It contains approximately 50 % bio raw materials. 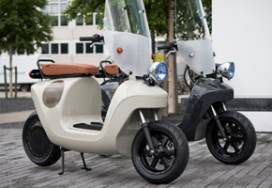 NPSP has developed interchangeable body panels of Nabasco biocomposite for the modular electric car named Nova, designed and built by a team of students from the Eindhoven University of Technology (TU/e). 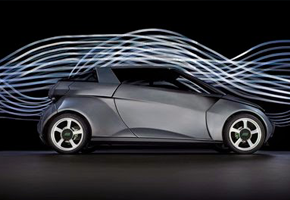 Nova is a radical electric three-seater with a modular approach that can completely be customised to suit driver demands. Weighing in at a mere 300 kg, the car is extremely lightweight thanks to its biocomposite components. 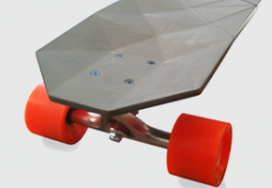 The vehicle achieved the design team’s aim, easily reaching speeds of 90 km/h and over. 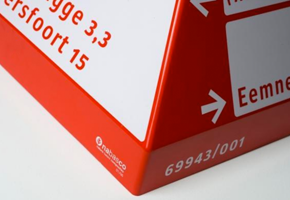 NPSP was asked by the Royal Dutch Touring Club (ANWB: Algemene Nederlandse Wielrijdersbond) to produce an environmentally friendly version of the familiar Dutch ANWB cycle-path signposts that is both better quality and more durable than the existing ones. The new signposts are made with natural fibres instead of glass fibre. According to the Life Cycle Analysis (LCA) method, this reduces their environmental impact by 40%.Thanks to the double-mould procedure, the new signposts are significantly more attractive and stronger than their predecessors. 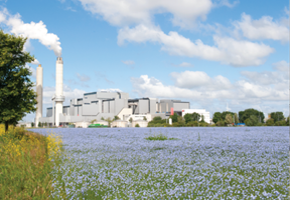 The production in a closed-mould system connected to active carbon filters reduces styrene emissions to a minimum. 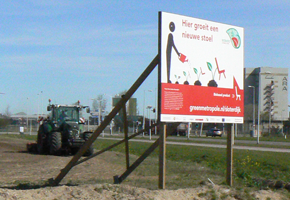 Three to four hundred bio-based signposts are produced each year and can be found throughout the Netherlands. 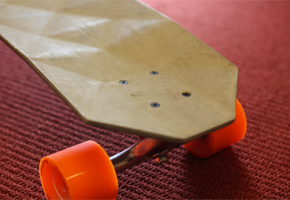 In close cooperation with NPSP, Rene Roman Smeets has designed and built a longboard (a type of skateboard) made of natural fibre composites. This high-performance natural fibre composite product mainly consists of flax and a natural resin. 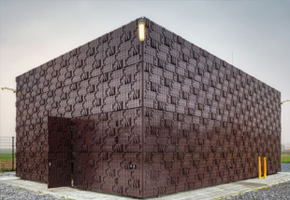 The material is also known as Nabasco® (Nature Based Composite). The fibre will be visible at the surface due to the semi-translucent resin used and a transparent coating that creates exposure. It gives a natural feeling important for emphasising the sustainability of the material. As yet, purely in terms of strength, natural-based composites still are weaker than their glass fibre forerunner. Regarding stiffness, however, they are actually quite similar. Fortunately the latter is often the limiting factor, especially when high-performance products like longboards are involved. If the board is stiff enough, the strength will generally be acceptable too. Natural based composites are much lighter than glass fibre composites, with an eco–friendlier production method. Working with natural-based composites is also much more sensible: exposure to glass fibre can cause skin inflammation. 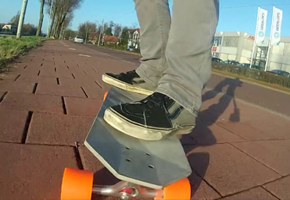 With natural based composites Rene Roman Smeets and NPSPO have manufactured a variety of boards, all customised to rider preference and purpose, including very stiff boards for mountain riders and very flexible ones for urban use. Epoxy injection on a single-sided mould under vacuum foil was first experimented with during the manufacturing stage of this project. This production process is especially relevant when making natural fibre composites. 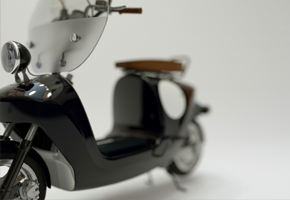 Vacuum-assisted resin infusion ensures that the resin completely seals the natural fibre surfaces. 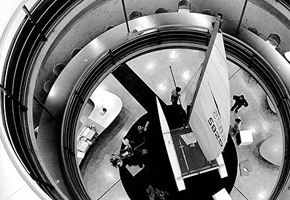 NPSP is the European industry leader in sustainable composites. Working with natural resources such as flax, hemp and bio-based resin, NPSP produces composites with a longer life cycle and a highly reduced waste production, while maintaining true value for money. The bio-based composites developed by NPSP are sold under the Nabasco® brand name, short for nature-based composites. 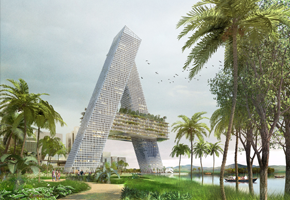 Cityblob is currently working on the new landmark building for Amaravati, the future capital city of Andhra Pradesh, India. The façade elements of the Capital A building will be made with natural fibres instead of glass fibre. Working with natural resources such agro waste and bio-based resin, we will produce composites with a longer life cycle and a highly reduced waste production, while maintaining true value for money. 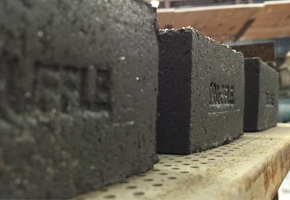 Agricultural waste can be a fabulous natural resource for bio-based building products. Agricultural waste could be converted into building elements and other engineering goods, providing farmers with often desperately needed additional income. This raw material is sustainable and biodegradable: the true way to go forward. The Provincial road N272 in the Netherlands is again open to traffic after a thorough renovation. Bio-based materials have been used on a large scale for this renovation. 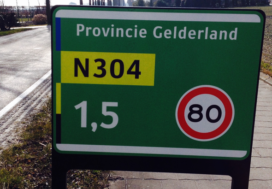 NPSP delivered road and hectometre signs produced from biocomposite on this sustainable road. In addition to the biocomposite traffic signs, the asphalt, the guide rails and the bench at the bus stop are also made of waste materials from the agricultural and paper sectors. The material has been developed in close cooperation with Staatsbosbeheer, AKZO Nobel, Waternet and the water boards Aa & Maas and HHNK.